Please try debugging your issues yourself. It says very clearly what happened. java.lang.NullPointerException: mca:memorial from mod Minecraft Comes Alive returned a null ItemStack in getPickBlock(...). Please report this to them. MCA is an extremely buggy mod. It loves being all alone in a pack, but once you begin adding other mods that we all love, it begins acting up. The people who created do not care, they are not known to work with other devs either from what I understand. Enable it in the in-game config. Somebody help me out with this. I was swapping out mods and, at one point, i saw a mod (and it could have been this one) that looked just like this one but it showed "what" the mobs ate, when they were sleeping or awake, and various other stats. It was 1.12.2 but, for the life of me i cannot find this mod again and (if it was this mod) what config made it show all that cool stuff? Please, i have been looking high and low to find this mod again (hoping it was this one) but can't reproduce it. Please, if anyone has the answer, email me here with the info and i would be eternally grateful. great mod i find this very useful in the twilight forest! Would be cool if you finally support agricraft for crop stats. Agricraft would have to add this. Because that is how compat works. 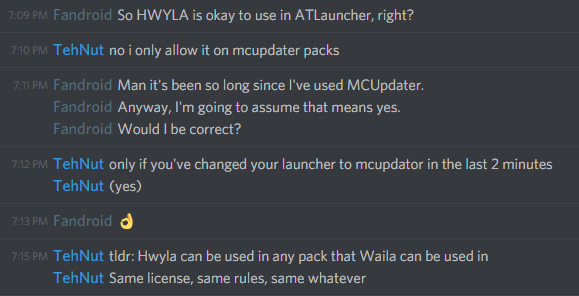 If they want their mod to work with Hwyla, they need to add it. does this still work with animalia? do you mind looking at the issues tab on github at the furnace not displaying correctly it appears to not work. Hwyla isn't working for me. The Show/Hide Waila setting under Config keeps resetting to hidden. I can toggle it to Visible, but when I back out it isn't saved. When I go back into the config it has reset to Hidden. Is there some way to save the settings? I have a mudpack through twitch and in the info for the mudpack it's showing that hwyla is installed but when I go to play the game it doesn't show up in the mod list and isn't displaying in game.